After reading the Age of Cryptocurrency, I had one new take away about blockchain technology. This epiphany moment was my understanding of the SHA256 hash. The description of how a hash worked put my understanding of the protocol on an even lower level. This hash function can take any input and will output a hexadecimal number output of 64 digits (0-1) , (a-z). 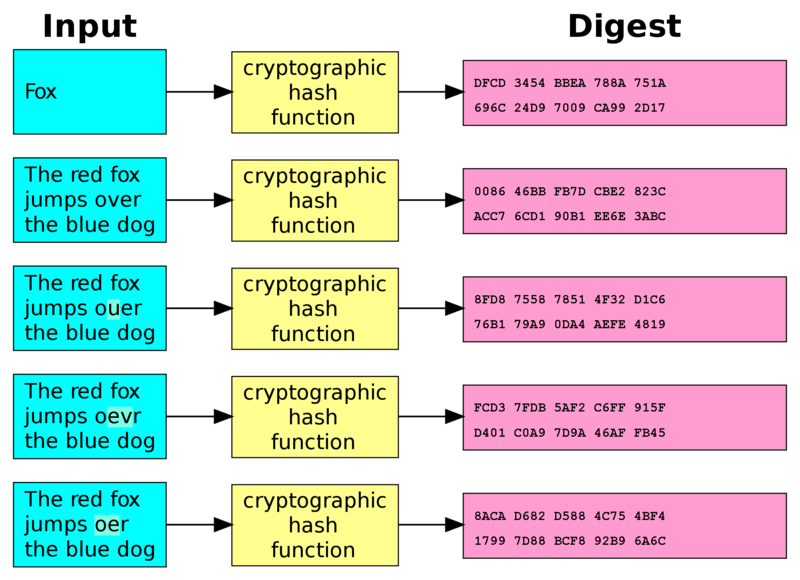 The data used by hash functions is referred to as a “message”, while the computed hash value is referred to as the “message digest”. If you compute a hash for a “,“ you will get a 64 character hash. If you compute a hash for “This is a hash”, you will get a 64 character hash. If you compute a hash for the entire text of a book, you will get a 64 character hash. The computed hashes in Bitcoin contain all of the transaction outputs that happened within that block of time. 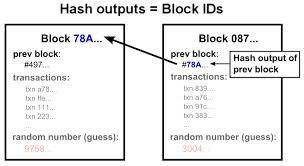 The newly computed hash (or block header) attaches the hash output of the previous block creating a chronological chain of spent transaction outputs. I always understood that the blockchain was an unchangeable ledger, but the way that the data was actually computed with hashes was a new discovery. Embedding data into a hash on an unchangeable decentralized ledger is powerful technology. The ledger comprised of these hashes, the blockchain, is a logically centralized, organizationally decentralized callable cryptographic record database. The combination of the SHA 256 hash, cryptographic private and public keys, and the timestamped ledger prevents the double spending of a bitcoin. This fundamental innovation is where the unimaginable blockchain 2.0 applications are born. The notion is that if you can decentralize money using hash functions, cryptographic keys, and distributed ledgers; you can compute any data into a hash that you want to be embedded into an irrefutable, global ledger. We combine this technology with a coded smart contract, combine this smart contract into a distributed ledger comprised of other smart contracts, and you have a whole new realm of decentralized applications and organizations. Every copy of the bitcoin blockchain is identical, every node is another reference of proof, another voice of the consensus, another verifier of the ledger. Miners, who essentially are the bookkeepers of the protocols, are rewarded with a write to the ledger in the form of an unspent transaction output. Satoshi has said “Bitcoin Mining is like flipping 37 coins all at once and trying to have them all come up heads”. If you accomplish this, you are rewarded with a number of writes to the ledger. The right to ownership is protected through the use of private cryptographic keys. That is why it really does not make so much sense to keep your coins in a “wallet”. You want to keep track of your keys so you should keep them on a keychain. If you can keep track of your keys and keep them secure, you will keep your coins. If you entrust your bitcoins to a company, you really don’t have control of your key, and consequently your proof of ownership of the coins associated with that key. Multisignature wallets between companies and customers are a step in the right direction but it makes more sense on an organizational level that with regards to bitcoin you should not be trying to manage a wallet with money in it, you should be managing your keys, regardless of what wallet, company, exchange, app your coins reside in. Often I will forget which exchange or app I have coins in, let alone trying to remember the email and password I have associated with it. Some sort of decentralized keychain is needed combined with biometrics, and an API that ports any newly created key to your keychain. For more on ECDSA keys read The Math Behind Bitcoin. Another hypothesis of mine that I confirmed was that ASIC miners would not just be used to mine bitcoins but would be essential to the perpetuation of blockchains based on the SHA 256 hash. No matter what version of future blockchain technology works whether it be sidechains, ethereum, or some unimaginable decentralized crypto platform; there will need to be miners processing the transactions. An ASIC Miner is essentially a mint a first because of the context of a coin, but the incentive to confirm the state of ownership could always evolve. The reward for running a machine that creates trillions of hashes a second could be extremely valuable as the ecosystem continues to grow and new blockchain uses emerge. I could allocate a couple hundred gigahashes at a sidechain, but for now bitcoin mining is the most profitable. The secure token of a bitcoin is essential to blockchain but some new incentive for a SHA 256 blockchain based ledger could be produced regardless if its value is derived from the original bitcoin blockchain. The big question is, “Is bitcoin the first cryptocurrency or the last one?”. I have heard this question a lot recently and the question is one that gives a very telling perspective as to the future of this technology phenomenon. The answer is arbitrary, but either way, the implications are profound. The entire business-to-business sales process can be integrated with blockchain technology. This is the first thing I thought of when I saw the relationship between CRM, QTC, and ERP systems. Decentralized ledgers of unspent transaction outputs for international finance, real-time triple entry accounting, human resource management, supply chain logistics, accounts, opportunities, quoting data, contract data, billing and revenue data; all of it computed into the global ledger through the SHA-256 hash function and called on to by people and machines to gain control and visibility into an unlimited range of applications in the b2b, p2p and m2m space. Business and enterprise software suites are distributed in scalable multi-tenant infrastructure relying on integrators, connectors, and APIs to link the systems together. The fundamental innovation is that blockchain technology is organizationally decentralized, logically centralized, cryptographically secure, and infinitely scalable. The next big business platform will be built using this 10x technology. It is all about solving enterprise problems with software to increase sales efficiency and ultimately increase revenue. The opensource development of blockchain based protocols will undoubtedly increase over time creating actual commercial applications that offer new found efficiency. Reusable components and contracts that can used by businesses by the sending of a micropayment to an address. Designers of these contracts can be paid by people and machines, a royalty for enabling a process. The better the application, the more expensive the micropayment per transaction. You could effectively create a platform where industry agnostic components are constantly fighting to be the the best at their given use case. Enterprise software platforms could use a a real-time streaming API to access the blockchain. The first platform to link blockchain technology will completely flip the table on the way that enterprise software can scale and be developed with an opensource protocol. This is way beyond any sort of decentralized currency and financial transaction protocol. This would effectively create a decentralized global business network that handles the storage, transfer, proof of ownership, and valuation of many digital assets, identities, and business productivity applications, all within one cryptographic, distributed, decentralized database. It completely automates trust. Any sort of intermediary previously needed to accomplish something in a sales process can now be automated and distributed with computer code based on met or unmet inputs. The first enterprise software platform that harnesses it will completely dominate the market.